While Savannah's famous urban plan is rightly renowned in many studies of urban history, what brings streams of tourists and architects to the city, and daily engages residents with its fascinating history, are not abstract principles of urban planning but a compelling fabric of buildings interacting with and shaping their built or natural settings. 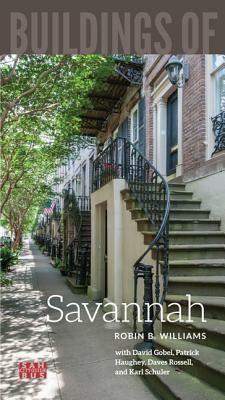 Buildings of Savannah, the first city guide from the Society of Architectural Historians' Buildings of the United States series, is a comprehensive, authoritative, and up-to-date guide to that dynamic built environment. Featuring over 350 buildings, landscapes, monuments, squares, and parks, enhanced and enlivened by 175 photographs and 30 maps, this book draws on new scholarship to document the city's familiar landmarks while it surveys the impressive range of Savannah's architecture in the city and beyond, including such fundamental but often-overlooked aspects as industrial and suburban architecture, midcentury modernism, and African American buildings and neighborhoods. Investigating broadly from the Riverfront to Tybee Island and from James Oglethorpe's six original wards to the Central of Georgia Railroad complex and beyond--including such well-known sites as the Mercer Williams House (celebrated for its role in Midnight in the Garden of Good and Evil), the birthplace of Juliette Gordon Low (who founded the Girl Scouts of America), Fort Pulaski, and Wormsloe Plantation-- Buildings of Savannah is an essential resource for all those who wish to know, understand, and preserve the architectural fabric of this unique and intriguing place. Robin B. Williams is Chair of the Department of Architectural History at the Savannah College of Art and Design, where his coauthors--Professors David Gobel, Patrick Haughey, Daves Rossell, and Karl Schuler--are members of the faculty.